The most common cause of kidney stones is dehydration. 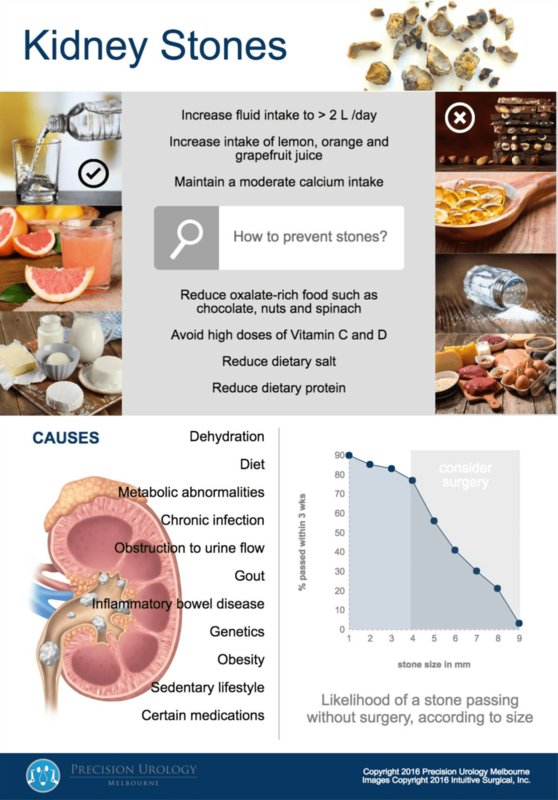 What simple measures can I take to reduce the risk of forming kidney stones? Some people have medical conditions that predispose them to forming kidney stones. These patients may require specific treatments to prevent stones forming in the future. Increase fluid intake to greater than 2 to 3 litres per day. Lemon, orange and grapefruit juices are preferable, as these increase the concentrations of stone-inhibiting chemicals in the urine. Decrease oxalate-rich food such as chocolate, nuts, spinach and Coca Cola. Avoid taking high doses of Vitamin C and Vitamin D, as this can also increase urinary oxalate. Try to maintain a moderate calcium intake (800 to 1000 mg/day). Too much calcium can lead to excess calcium being absorbed by the body. Too little calcium can lead to an increase in oxalate absorption, which can result in calcium oxalate stones. Try to reduce salt in the diet, as a high sodium diet can lead to high levels of calcium in the urine. High protein diets increase urinary calcium, uric acid and oxalate and reduce pH and citrate, all of which contribute to stone formation. A 70 kg male should aim to have less than 60 to 70 grams of protein per day. Why do stones cause pain? 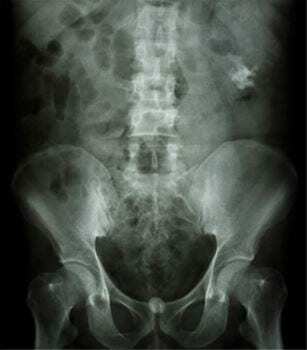 Stones cause pain when they block the outflow of urine from the kidney. This pain will come and go, in waves, until the stone has passed out of the ureter. Smaller stones are more likely to pass out of body without needing surgery. A 3mm stone, for example, has an 83% chance of passing by itself within 12 days. When is it reasonable to observe a stone? In these circumstances, a patient can be safely sent home from hospital with tablet pain medications and clinic follow-up. Smaller stones have a higher chance of passing spontaneously with adequate pain relief and appropriate medications. In many circumstances these patients will not need surgery and can be safely observed out of hospital. Larger stones, or those that have failed to pass after an appropriate period of observation, will require surgery. Patients who require surgery for their stones will, in many cases, require placement of a ureteric stent. This involves a quick procedure under general anaesthesia whereby a telescope is placed into the bladder via the urethra. This telescope is then used to pass a wire into the opening of the ureter and up into the kidney, beyond the stone. A long rubber tube is then fed over the wire and released so that it stays in place in the ureter. This tube allows urine to drain past the stone, thereby relieving the pain. There are no cuts on the outside of the body and no wires or tubes coming out of the body. The patient goes home with the stent and then comes back to have their stone treated. There are two reasons for this: firstly, placing a stent to relieve pain also stops all muscle activity in the ureter, meaning the stone can no longer pass out by itself; secondly, the stent causes the ureter to dilate, making it easier and safer to pass instruments to the level of the stone during subsequent surgery. When a stone is associated with infection a patient can become very unwell. In most cases they will need to be admitted to hospital for intravenous antibiotics. A tube through the skin (nephrostomy) may be required to bypass the obstructing stone and drain the infected urine from the kidney. Once the infection is under control the stone itself can be treated. What are the available surgical treatment options? There are many different ways to treat stones in the kidney and ureter. The choice of treatment will depend on factors such as size and location of the stone and the overall health of the patient. In extracorporeal shock wave lithotripsy (ESWL), shock waves are directed through the skin and focused onto the stone, causing it to fragment into smaller pieces. These fragments then pass out of the body in the urine. ESWL is most suitable for softer stones, less than 2cm in size, in the upper part of the kidney. It is not safe in pregnant women, obese patients, patients with aortic aneurysms and those who take blood-thinning medication. Ureteropyeloscopy involves passing a long, narrow telescope through the urethra and bladder and into the ureter, up to the stone. A laser fibre is then used to fragment the stone into smaller pieces. In most cases these fragments can then be extracted. It is particularly useful for smaller stones, in any part of the kidney, and allows treatment of stones in the ureter and kidney at the same time. In percutaneous nephrolithotomy (PCNL), a channel is developed through the skin and muscle of the back, into the kidney. Instruments are then passed through this channel to break up and remove the stone. PCNL can be used for any stone in the kidney, regardless of size, location or composition. However, this is a more invasive operation.